DALLAS (Reuters) - The Texas boy arrested for bringing to school a homemade clock that was mistaken for a bomb is moving to Qatar, his family said on Tuesday, a few hours after he was at the White House for an astronomy night hosted by President Barack Obama. 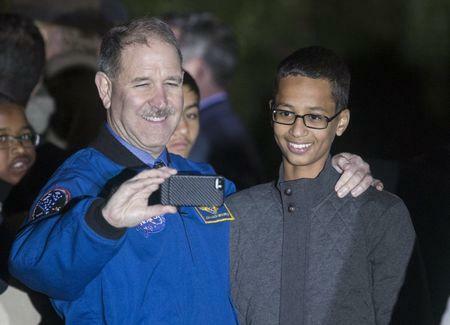 Ahmed Mohamed, 14, a bespectacled ninth-grader who became an Internet sensation for an arrest that supporters said was influenced by bias against his Muslim religion, has accepted an offer from the Qatar Foundation to study at its Young Innovators Program. "This means, that we, as a family, will relocate to Qatar where Ahmed will receive a full scholarship for secondary and undergraduate education," his family said in a statement. The teenager, who dabbles in robotics and had attended a Dallas-area high school, has basked in celebrity status since his arrest in September. The family has been traveling the globe to meet dignitaries. Sudanese state radio reported that his father took him to meet Sudanese President Omar al-Bashir. The Sudanese leader is accused by the International Criminal Court of masterminding genocide, crimes against humanity and war crimes during Sudan's Darfur conflict. No charges were filed and police in the Dallas suburb of Irving said in September they were reviewing their actions in the case..
At the White House on Monday night, Obama briefly met Mohamed as he shook hands with students at the event, giving the student a hug. At the time of the arrest, Obama's Twitter feed had a message of support for Mohammed, which read: "Cool clock, Ahmed. Want to bring it to the White House? We should inspire more kids like you to like science. It's what makes America great." "It was amazing, and a honor meeting President Obama," Mohamed said on Twitter after meeting Obama.